Doug and Cheska Kramer talk about how they try to treat their children equally. 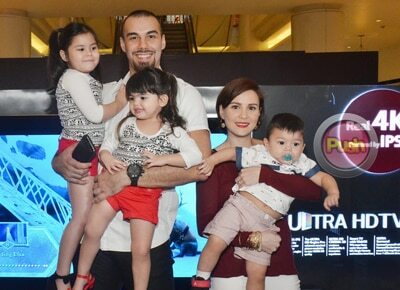 Doug and Cheska Kramer shared that they don’t encourage favoritism in their household. “No, in our house walang pwedeng magsabi ng favorite si ganito, favorite si ganyan, bawal ‘yun. We do not allow that. It is not allowed in the house. Lahat sila they are so adorable so bawal [ang favoritism] sa family namin,” Cheska said in an interview during the Wellness Event for Robinsons Supermarket at Robinsons Magnolia. Doug remarked that they make each of their kids feel that they are unique. “You know what they say, in their own ways they are special like Kendra, she is so special because she is our first baby. Scarlett is also special because she's our bunso girl. Gavin is so special because he is our only boy and our bunso so alam mo ‘yun we make it seem that way. Hindi ‘yung one has lamang over the other,” he said. Doug and Cheska also shared that they don’t encourage giving off prizes whenever their kids accomplish something. “We don’t make them dependent on that all the time. Parang we don't want to make it seem like it's always work, that's why we always want to make it fun. We don't always give them a prize for everything parang when you instill that in their mind parang gagawin nila, ‘Ahhh we won't do this until you give us a prize’ di ba? Parang we do it as a family, as a fun experience. Occasionally, we'll give them something but not all the time,” Doug relayed.